During the month of October 2014, Brother Alois and four other brothers spent several weeks visiting four Caribbean countries. 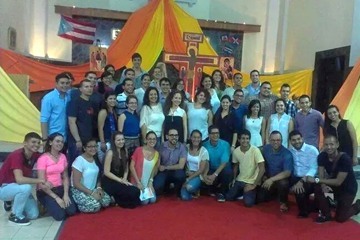 Many young people came to take part in prayers in Puerto Rico, Haiti and Cuba with the journey ended with a youth meeting in the Dominican Republic. The pilgrimage began with a prayer in Caguas Cathedral, Puerto Rico. Bishop Reuben, who has visited Taizé often, gave a wonderful warm welcome to the brothers. Brother Alois was also invited to speak at the university about the pastoral work the community does with young people. 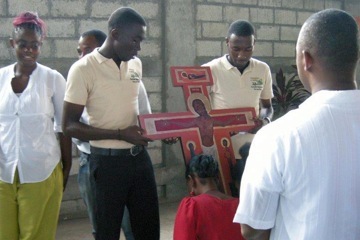 From Friday 10th October, until Monday 13th the brothers were in Haiti. The first of three prayers took place in Petite-Rivière des Nippes, a town in a beautiful area by the sea. The next day the brothers were expected in the centre of the country, in the town of Hinche. In the old cathedral, the participants had a time of intense prayer with songs from Taizé but also many other well-known songs from the country. On the third day the brothers made a brief visit to the Sisters of Charity who live in the poor neighborhood of Cité Soleil, located on the outskirts of the capital, Port-au-Prince. In 1983, when Brother Roger was in Haiti, he lived with a group of brothers in this neighborhood. In the afternoon a prayer with the young people took place in the city centre. Everywhere they went the brothers were touched by the fervour with which the young people took part in the prayers. In Cuba, we were surprised to be so expected. One of our brothers was there in the 1970s, but otherwise it was the first time we took a step in this country. Cubans, especially the young, are desperate to leave their isolation, they need to feel close to young people in other countries, and they urged us to greet you all from them. 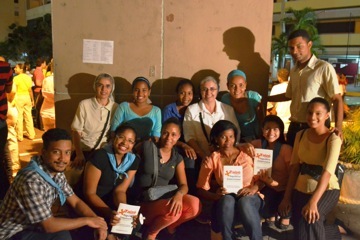 In Havana and Matanzas, before prayer, the brothers led a meeting with the young people. Some groups came from very far away to take part. One group travelled twelve hours by bus from Santiago de Cuba. During the meeting, many young people asked questions about faith, prayer, living solidarity with others in today’s world. Brother Alois invited them to write down prayers and to bring them to the brothers during the time of prayer around the cross. From Friday 17 to Sunday 19 October, the pilgrimage came to a close in Santo Domingo, where the five brothers came together to take part in a youth meeting with several hundred young people from across the Dominican Republic. Some young people also made the journey from other countries, such as Chile. "This meeting in the pilgrimage of trust was a great blessing for my life. It left me with a renewed confidence that God is present in the simple things of life, and in the service we give to others." In the afternoon and evening prayers and meetings on various topics were held at Colegio Loyola. The meals were served in the school yard by the young people of the Haitian mission in Santo Domingo. 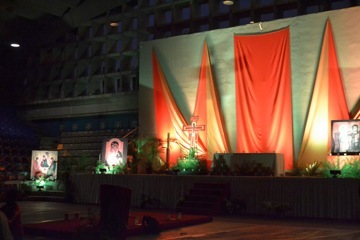 A sports hall was transformed into a place of worship. On the last evening, people from the city joined the young people for a prayer with the symbol of the light of the Resurrection. 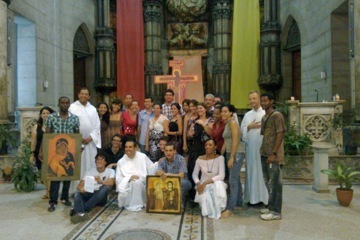 The participants were welcomed by twelve parishes in the city. Young people from these parishes prepared times of prayer and discussion on Saturday morning and Sunday after the Eucharist. Families opened their homes to offer hospitality to the pilgrims who came from outside the city. On Sunday, the brothers took part in the Eucharist in the large parish in a poor neighborhood of 30,000 people. They were surprised to see the church quite empty. In fact, it was Mission Sunday, and many people were on a mission, visiting homes, talking with people, before coming back for the Eucharist together in the late afternoon. The parish is divided into four sectors where a man and women are responsible for pastoral care and faith teaching. In each sector there are house groups that meet weekly. During the week there is no celebration of the Eucharist in the main church, but each day its is said in a chapel or a garage in one of the neighborhoods. The priest said that this change was difficult at first, but now more people are able to come to pray because of the initiative. "We have taken a lot of things from this meeting that we want to put into practice in our parish. We started a group to encourage silent prayer for one hour each week. This gives us the opportunity to pray for the poorest of our people and the world. This is also an opportunity to give thanks for all the blessings that God gives us every day. During the meeting, we met young people from other parts of the country and abroad, and shared ideas that will support our groups. This experience has been a blessing for us." After the meeting in Santo Domingo one of the brothers returned to Cuba for some days. Many people told him, "You haven’t forgotten our country. For us it’s important to know that we are not alone. That helps us to keep going."